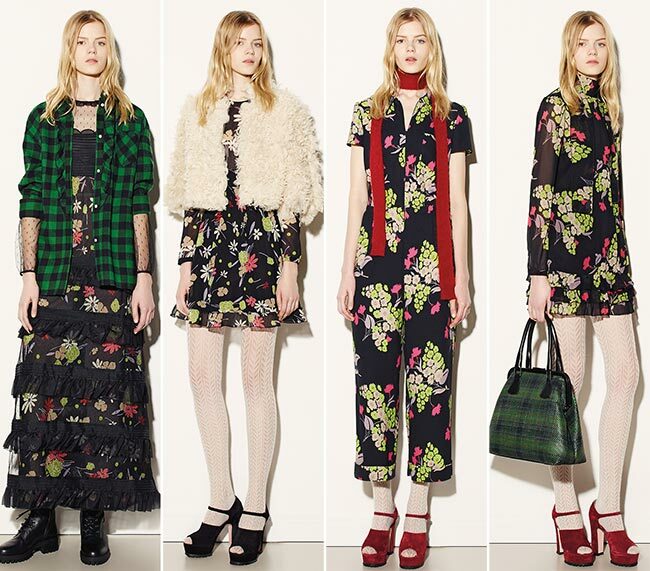 Inspired by Kurt Cobain, the RED Valentino fall/winter 2015-2016 collection brought a romantic and dreamy atmosphere to the first day of New York Fashion Week fall 2015 with its princess-worthy dresses, cute patterns and enchanting retro style imprinted on every single design available in the lineup. As always, Maria Grazia Chiuri and Pierpaolo Piccioli have managed to take us to the imaginary world of fairy-tales with their talent of injecting so much innocence and whimsical allure to their one-of-a-kind creations. The big diversity of styles, colors and the mind-blowing tiny details that add to the cuteness overload are some of the aspects of the new RED Valentino line that will instantly have you infatuated with these pieces! Fall is extremely spring-y and colorful for the RED Valentino girls this year, as instead of opting for chunky knits and subdued colors, she gives preference to flirty little dresses and bright floral prints. Exactly this way debuts the collection bringing an entire garden of pretty flowers appearing on a black background mostly. To break the summer overdose, the designers have teamed floral printed dresses with grunge-style plaid shirts, coming in grass green and black, or red and black tones. Although at first sight this may seem a dangerous combination for you, it does lead to unique and fresh looks, where contrast is the main focus. Whether it’s a floral printed maxi dress or a combo of a see-through black shirt and a mini skirt, topping the look with a plaid shirt you’ll instantly inject a unique vibe and youthfulness to your looks. Checkered prints start to make an appearance more occasionally as the collection develops and we get introduced to such lovely looks as the combo of a green checkered skirt worn with a lovely short cape-coat featuring the same colors and the same material, which is topping a plaid green-and-black shirt with a lovely bow detail on the neck. There are also monochrome checkered looks using black and white colors, from shirts with bow details on the part of the neck to mini dresses, skirts and even coats with faux fur collars. Although a big part of the RED Valentino fall/winter 2015-2016 collection is dedicated to floral and checkered prints and bright colors, there are also more monochromatic looks for those, who are more into a simplistic style. Think simple black flared mini skirts worn with black-and-white striped shirts, a sleeveless black jumpsuit, a tweed skirt suit, and an office-ready gray suit featuring a pair of trendy culottes. The unique retro silhouettes used only enhance the dolly look of these outfits. Further, we are treated to an array of mind-blowing party and cocktail dresses featuring lovely muted colors and unexpected circus prints (think clowns and acrobats), embroidery and appliqués, which also adorn the outerwear pieces topping the looks. So forget about the traditional plaid, leopard and floral patterns (which still look uber-imaginative in the collection) and go for statement-making circus themes to stand out in the crowd. Other big trends present throughout the collection are the mohair cardigans, the Mongolian lambskin little coats and vests, the fur jackets and Seventies style jeans. The retro-style handbags available in different shapes, shades and sizes and the platform suede heels are must-have accessories to complete these absolutely bedazzling clothing pieces. Agree picking just one or two pieces from this marvelous collection is going to be a really hard task!